BANG SARAY:--Neighbors turned in a Bang Saray man who allegedly assaulted his wife while using drugs. 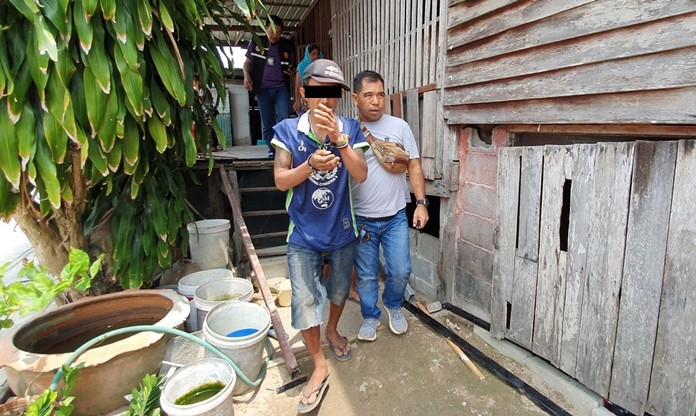 Sattahip District Chief Anucha Intasorn and security officers detained Nipon Kongton, 41, at his Soi Madee house March 31. Authorities said Yod is an ex-convict who served time for drug dealing. Neighbors complained he often was high and made a nuisance of himself, but the final straw was when he beat up his wife. Not wanting to intervene themselves, neighbors called police. Hardly turning on him, reporting him to Thai police! At the least they could have given him a good kicking.